Frankly, we serve the BEST dogs! What Two Words Does Yank Love? That's right, Yank, Hot Diggity and (the recently crowned) French Fry King spent the afternoon thoroughly enjoying the Sysco Food Show. 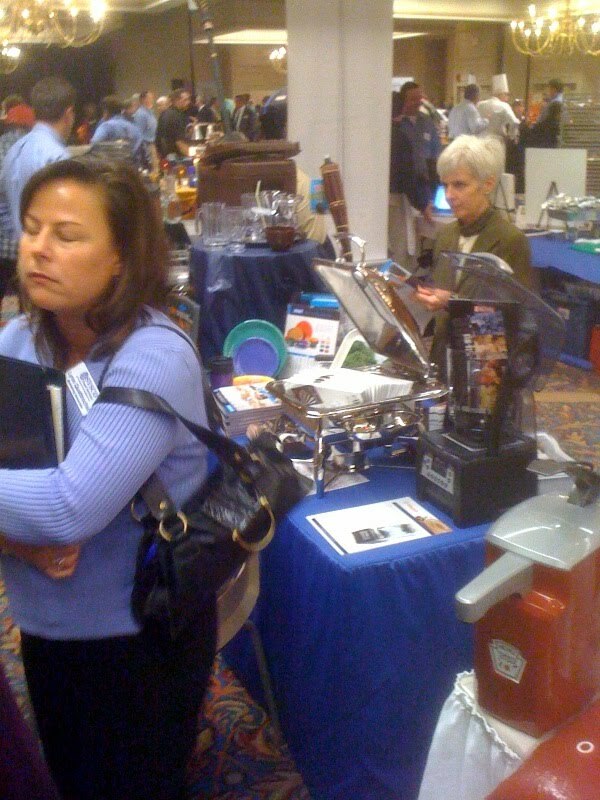 Of course, the primary goal of attending a Food Show is new menu ideas. This show didn't disappoint. It provided a great menu idea for our upcoming season (which, by the way, is just a little over three weeks away). I'm going to hold off on telling you what this idea is. The truth be told, most of you won't think of it as anything groundbreaking, but those that have followed our progress will be surprised (pleasantly surprised, I believe). Some of the ideas for the coming season that I've discussed before are taking shape. I would like to share a couple of them with you. This year you will see a Pulled Pork Sandwich on the menu. You'll have your choice between a Sweet (not too sweet) BBQ Sauce or a Spicy and Smooth BBQ Sauce. Also, new to the menu is a Specialty Dog that I'm thinking of calling, The Angry Dog, The Dog That Bites Back! It will be made with the new Yank's Angry Sauce. Warning...it really will bite you back. The season is getting close. We can't wait. Frankly, we serve a very Angry Hot Dog Sauce! Yank's Franks Opening Day will be Saturday, May 21st. Yank's will be open weekends (Saturday and Sunday) from 11:00 am to 3:00 pm. Beginning Saturday, June 18th, Yank's will be open 7 days per week from 11:00 am to 3:00 pm. The 7-day per week schedule will continue through Labor Day, Monday, September 5th. After Labor Day, Yank's will be back on the weekend schedule through Columbus Day, Monday, October 10th. We're getting excited, we're working on new Specialty Dogs, the perfect Pulled Pork Sandwich and a few other new offerings. If you are a fan of Yank's Super Crispy French Fries, you'll love the Chili Fries (or the Chili-Cheddar Fries). And speaking of chili, Yank's Beantown Chili will be available by the cup during the entire season. We have a new sign being built. It will certainly be up before opening day. When it's ready, I'll have photos so you will know what to look for. And last but not least (okay, maybe it is least), we have a new name for one of our hot dog researchers. The Hot Dog King has been stripped of his title, but don't feel bad for him. He still is King except from here on he'll be referred to as The French Fry King. This new title is far more appropriate and frees up The Hot Dog King title for someone who is a true lover of encased meats. The French Fry King's true passions are Cheeseburgers and French Fries. That's it for now. I'll keep you posted. Frankly, we can't wait until Opening Day! The latest Yank's Franks spotting is in Bump's Guide, The Hot Dog Edition. Exactly what does this mean? I'm sorry, I really have no idea. However, it is always nice to be noticed and if you click around Bump's Guide, it's kind of fun. Hot Dog Season, aka Baseball Season is upon us, and it is predicted by Major League Baseball that us fans will consume 22.5 million hot dogs at ball parks during this 2011 season. In another stunning prediction, Hot Dogger Extraordinaire, Yank predicts the Boston Red Sox will win the American League Pennant and will go on to take the World Series in six games. Let me be the first to congratulate the Red Sox. Frankly, Yank's Franks loves the Boston Red Sox! This blog is meant to chronicle the step-by-step process of taking an entrepreneurial effort from being just a dream to a reality. I'll share our efforts toward selecting a name, a menu, a logo, a location, as well as everything before, after, and in between.